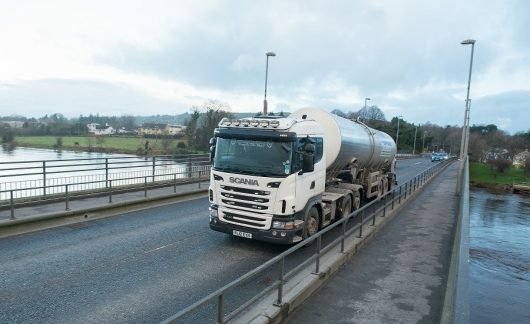 In the EU, the mild winter weather has continued into early spring leading to expectations of an early summer flush, with German flows recovering and with UK, Polish, Irish and Danish flows continuing to show strength. In the UK, 2018 collections were up +0.2% y-o-y but flows in early 2019 are up +1.7%. 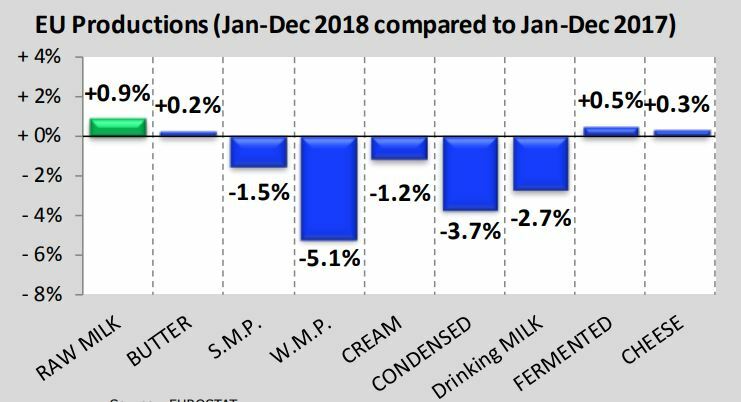 In the US, 2018 collections were up +0.9% y-o-y with cow numbers falling but output per cow up. Collections in New Zealand are up +7.7% in early 2019 but this compares to weak output from the previous year. South American and Australian output will remain hindered due to weather and margin factors. The UK cheese market is quiet because of Brexit, though prices remain stable. Cumulative output across the EU for 2018 is up +0.3% with solid output in Germany, Holland and Poland. There is evidence of higher stocks of hard and cheddar cheese due to Brexit. The EEX Butter Index is down €292/tonne on last month at €4,100/tonne and the SMP Index is marginally up at €1,968/tonne. 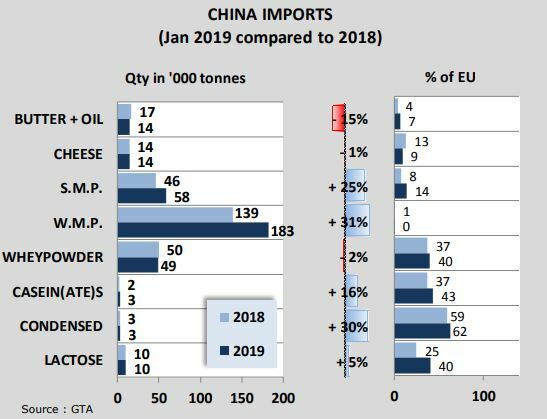 Chinese imports of powder in January are up year on year with SMP imports up 25% and WMP imports up 31%. Overall, the equilibrium between fat and protein is rebalancing back towards protein.